This Error Message Article explains the CODESOFT error message “Lv Loader Cannot Create Directory” that is generated when CODESOFT is attempting to convert another application file (e.g. LABELVIEW) and details how to fix the underlying problem that caused it to appear. This problem occurred mostly in a networked environment. CODESOFT did not have permissions to create a folder for conversion. 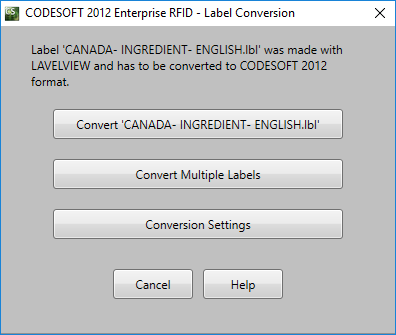 CODESOFT needs to create a folder to store the label configuration settings during the conversion process. 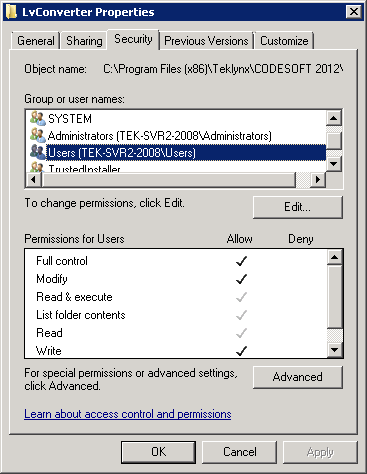 In the situation mentioned above, CODESOFT did not have permissions to create a folder for conversion. CODESOFT attempts to create a folder (called LvConveter) to house the label configuration settings. You may need assistant from IT to perform this task – To grant those permissions, the “Users” group was selected in the folder properties of the LvConverter folder. Full Control, Modify, and Write permissions were granted. This allowed the conversion process to continue without the ‘Lv Loader Cannot Create Directory’ error message.